Observations of global temperatures spanning longer than a century indicate that the Earth has warmed by 1.5°F on average between 1880 and 2012 (Figure 1). Warmer temperatures are not limited to the atmosphere; ocean surface waters (top 250 ft.) warmed by +0.6 to +0.9°F from 1971 to 2009 (global average). 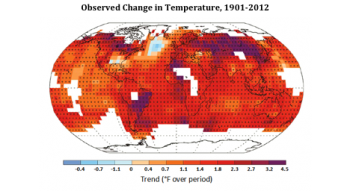 Warming trends are evident at nearly all depths in the ocean¹. Extreme events have become more commonplace occurrences globally, including more frequent heat waves heavy rainfalls since 1950 and fewer cold snaps . Figure 1. Significant warming has been observed in most locations. Observed changes in air temperature at the Earth’s surface between 1901 and 2012. Red and purple colors indicate places that warmed while blue colors indicate places that cooled. White areas indicate places where data were insufficient to permit a robust trend estimate. The ‘+’ signs indicate grid boxes where the direction of the trend is statistically significant. Figure and caption adapted from IPCC 2013. Temperatures in the U.S. are consistent with global trends over the last century: recorded temperatures indicate an average increase of 1.5°F since 1895, with different warming rates in different regions (Figure 2). Heavy downpours are increasing in most regions of the U.S., especially over the last three to five decades, although trends for the Pacific Northwest are ambiguous [2,3]. The length of the frost-free season (and the corresponding growing season) has been increasing nationally since the 1980s. During 1991-2011, the average frost-free season was about 10 days longer than during 1901-1960. 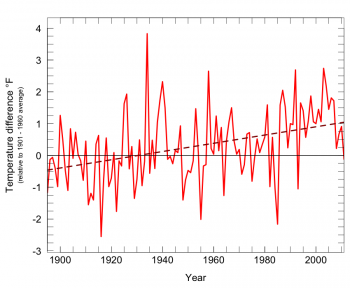 The largest increases for this period occurred in the western U.S [2,3]. Figure 2. 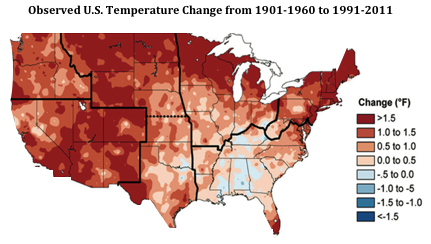 Warming has been observed for much of the continental U.S. Red colors indicate places that warmed while blue colors indicate places that cooled. In both cases this was calculated as the difference in temperature between the average for 1991-2011 and average temperature for 1901-1960. Figure and caption adapted from Ch. 2 in Draft 2014 U.S. National Climate Assessment. The Pacific Northwest warmed about +1.3°F between 1895 and 2011, with statistically-significant warming occurring in all seasons except for spring [4,5]. 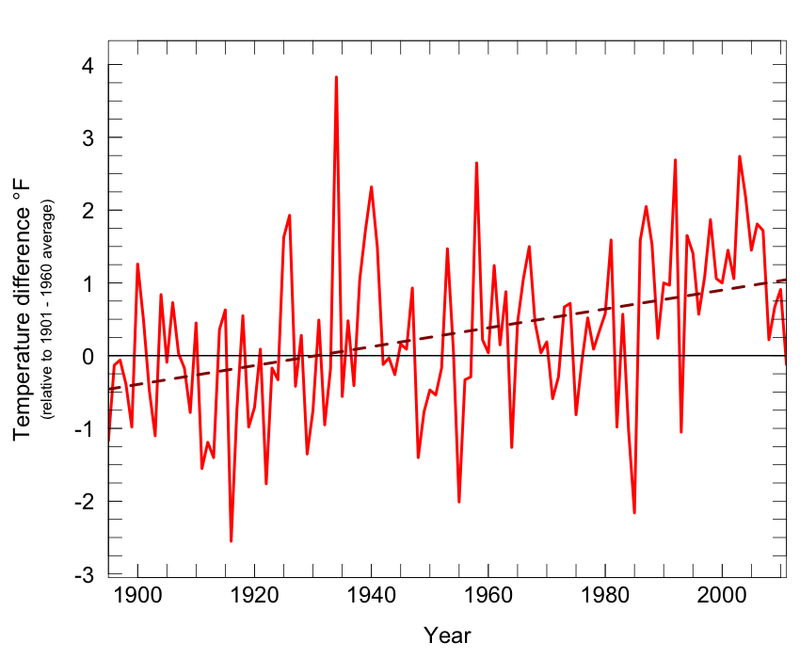 All but five of the years from 1980 to 2011 were warmer than the 1901-1960 average (Figure 3) . Warmer temperatures have increased the frequency of warmer extremes and mitigated cooler averages. Nighttime heat events have become a more occurrence west of the Cascade Mountains in Oregon and Washington (1901-2009) . The frost-free season (and the associated growing season) has lengthened by 35 days (±6 days) from 1895 to 2011 . Figure 3. Rising temperatures in the Pacific Northwest. Average annual temperature (red line) shown relative to the 1901–1960 average (indicated by the solid horizontal line). The dashed line is the fitted trend, indicating the +0.13°F/decade warming for 1895-2011. Data source: Kunkel et al. 2013 . Other indications of warmer regional temperatures are evident in snow, ice and streamflow trends. Spring snowpack fluctuates substantially from year-to-year, but declined overall in the Washington Cascades from the mid-20th century to 2006 [7,8]. This trend is due primarily to increasing regional temperature and reflects the influence of both climate variability and climate change [9,10]. Natural variability can dominate over shorter time scales, resulting (for example) in an increase in spring snow accumulation in recent decades . The State of Washington bears the majority of the glaciers (174 out of 266 sq. miles) found in the continental U.S. . Although there are some exceptions, most Washington glaciers are in decline. Declines range from a 7% loss of average glacier area in the North Cascades (1958-1998)  to a 49% decline in average area on Mt. Adams (1904-2006) . These overall trends in snow and ice declines affect the region’s streamflow patterns. The spring peak in streamflow is occurring earlier in the year for many snowmelt-influenced rivers in the Pacific Northwest (observed over the period 1948-2002) as a result of decreased snow accumulation and earlier spring melt . The role that human activities is playing in the observable changes of the global climate is becoming increasingly unequivocal as advances in climate science are realized. The atmospheric concentration of carbon dioxide (CO2) increased +40% between 1750 and 2011 as a result of human activities, nearly reaching 400 ppm in 2013. Atmospheric concentrations of CO2, methane, and nitrous oxide have increased to levels unprecedented in at least 800,000 years . The IPCC now estimates that “more than half of the observed increase in global average surface [air] temperature from 1951 to 2010 was caused by the anthropogenic increase in greenhouse gas concentrations and other anthropogenic forcings together.” . Furthermore, the IPPC determined that the effects of human emissions of greenhouse gases must be included in order for models to correctly simulate the observed 20th century pattern of warming. How much and how fast climate changes occur in the future depends on both the amount of greenhouse gas emissions and how the climate changes in response to those emissions. As a result, projecting future climate requires making assumptions about future greenhouse gas emissions and then modeling the climate’s response to those emissions. Irreducible uncertainty in both climate and future greenhouse gas emissions means that projections of future climate will always involve a range of scenarios. The most updated global climate projections were released by the IPCC in 2013 . These apply new versions of well-established climate models that simulate changes in the Earth’s climate. New climate models project similar climate changes for the same amount of greenhouse gas emissions. Differences between warming projections for the previous 2007 (dashed lines in Figure 4) and the updated 2013 (solid lines in Figure 4) IPCC reports are mostly due to differences in greenhouse gas scenarios (Figure 4). Figure 4. All scenarios assume continued growth in atmospheric levels of greenhouse gases for the next few decades. The figure shows total CO2 concentration, in parts per million (ppm), for each greenhouse gas scenario. Though not the only greenhouse gas, CO2 emissions are the dominant driver of global warming. The old greenhouse gas scenarios (dashed lines) have close analogs in the new scenarios (solid lines) – similar scenarios are plotted using similar colors. Actual concentrations for 1990-2010 are shown in grey. Figure source: Climate Impacts Group, based on data used in IPCC 2007 and IPCC 2013 (http://tntcat.iiasa.ac.at:8787/RcpDb and http://sedac.ciesin.columbia.edu/ddc/sres/). The scenarios of future greenhouse gas concentrations are used to determine the amount of warming we can anticipate over this century. The CMIP3 models and SRES scenarios were applied in the IPCC 2007 report and the CMIP5 models and RCP (Representative Concentration Pathways) scenarios were used in the updated IPCC 2013 report. The results expressed as global average temperature increases are shown in Figure 5 (temperature changes are compared to the 1986-2005 average). The Pacific Northwest is projected to warm rapidly during the 21st century, relative to 20th century average climate, as a result of greenhouse gases emitted from human activities. The actual amount of warming that occurs in the Pacific Northwest after about 2050 depends on the amount of greenhouse gases emitted globally in coming decades . Regardless of the scenario, warming is projected to continue throughout the 21st century in the Pacific Northwest. 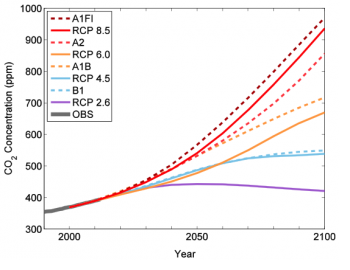 For the 2050s (2041 to 2070) relative to 1950-1999, temperature is projected to rise +5.8°F (range: +3.1 to +8.5°F) for a high greenhouse gas scenario (RCP8.5). 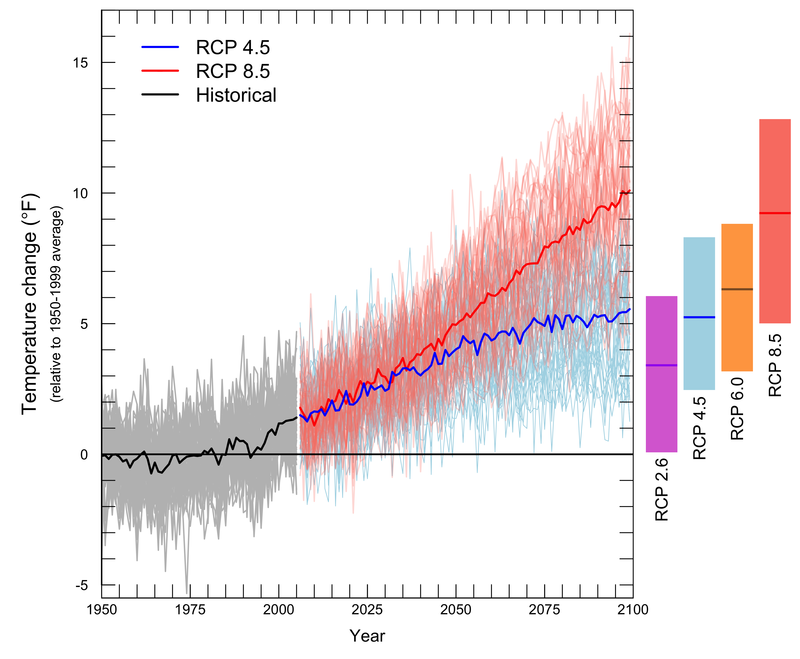 Much greater warming is possible after mid-century under the more aggressive scenarios (RCP 6.0 and 8.5); alternatively, lower emissions of greenhouse gases will result in less warming (Figure 6). Figure 6. All scenarios project warming for the 21st century. The graph shows average yearly temperatures for the Pacific Northwest relative to the average for 1950-1999 (gray horizontal line). The black line shows the average simulated temperature for 1950–2011, while the grey lines show individual model results for the same time period. Thin colored lines show individual model projections for two emissions scenarios (low: RCP 4.5, and high: RCP 8.5), and thick colored lines show the average among models projections for each scenario. Bars to the right of the plot show the mean, minimum, and maximum change projected for each of the four emissions scenarios for 2081-2100, ranging from a very low (RCP 2.6) to a high (RCP 8.5) scenario. Note that the bars are lower than the endpoints from the graph, because they represent the average for the final two decades of the century, rather than the final value at 2100. Figure source: Climate Impacts Group, based on climate projections used in the IPCC 2013 report. Changes in precipitation are not as distinctive in the model results. This is primarily because shifts in precipitation are predominantly governed by natural variability and this will continue to be the case in the future. Models indicate that changes in annual and seasonal precipitation will continue to be primarily driven by year-to-year variations rather than long-term trends, however heavy rainfall events are projected to become more severe. Projected changes in total annual precipitation are small (relative to variability)  and show increases or decreases depending on models, which project a change of −4% to +14% for the 2050s (relative to 1950-1999). Although the models do not point to significant changes in annual average precipitation, seasonal projections paint a different future. Most models project drier summers, with an average model projection of −6% to −8% for the 2050s for a low and a high greenhouse gas scenario, respectively (2041-2070, relative to 1950-1999). 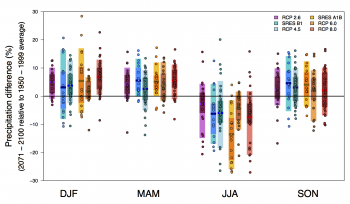 Some individual model projections show as much as a −30% decrease in summer precipitation (Figure 7). A majority of models project increases in winter, spring, and fall precipitation for this same time period, ranging from +2 to +7%, on average . Figure 7. Projected changes in seasonal precipitation for the Pacific Northwest for the 2050s (2041-2070, relative to 1950-1999). Seasons are denoted by months: DJF is winter, MAM is spring, JJA is summer and SON is fall. Projections are shown for all four new scenarios: RCP 2.6 (“very low”), 4.5 (“low”), 6.0 (“medium”), and 8.5 (“high”), along with the older projections based on the B1 (“low”) and A1B (“medium”) scenarios used in many Pacific Northwest impacts assessments. Individual climate model projections for each scenario are shown using colored dots. 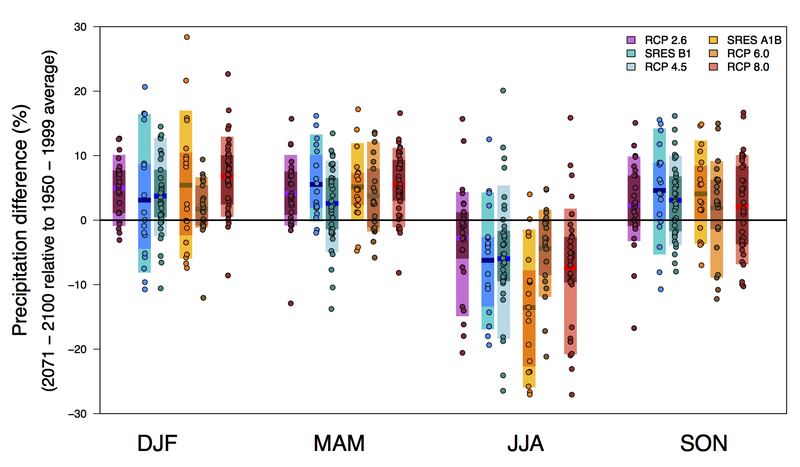 Boxes show the average projected change (expressed as percent change), along with the 10th, 25th, 75th, and 90th percentile values among all climate model projections. The black horizontal line denotes zero change. Figure source: Climate Impacts Group, based on climate projections used in the IPCC 2013 report. and figures 2.5b and 2.6 of Mote et al., 2013. Finally, models also indicate that the Pacific Northwest could encounter more frequent and intense precipitation extremes in the future. Heavy rainfall events are projected to become more severe by mid-century. Specifically, the number of days with more than 1 inch of rain is projected to increase by +13% (±7%) for the 2050s (relative to 1971-2000) for a high greenhouse gas scenario. Walsh, J. et al., 2014. Our Changing Climate. Chapter 2 in the draft 2014 U.S. National Climate Assessment, http://ncadac.globalchange.gov/. Kunkel et al., 2013. Regional Climate Trends and Scenarios for the U.S. National Climate Assessment: Part 9. Climate of the Contiguous United States, NOAA Technical Report NESDIS 142-9, NOAA National Environmental Satellite, Data, and Information Service, Washington, D.C.
 Mote, P.W., 2003. Trends in temperature and precipitation in the Pacific Northwest during the twentieth century. Northwest science, 77(4), 271-282. Kunkel, K.E. et al., 2013. Part 6. Climate of the Northwest U.S., NOAA Technical Report NESDIS 142-6. Bumbaco, K. A. et al., 2013. History of Pacific Northwest Heat Waves: Synoptic Pattern and Trends. Journal of Applied Meteorology and Climatology, (2013). Fountain, A.G. et al., 2007. Digital outlines and topography of the glaciers of the American West: U.S. Geological Survey Open-File Report 2006–1340, 23 pp. Sitts, D.J. et al., 2010. Twentieth century glacier change on Mount Adams, Washington, USA. Northwest Science 84(4): 378-385. Mote, P. W. et al., 2013. Climate: Variability and Change in the Past and the Future. Chapter 2, 25-40, in M.M. Dalton, P.W. Mote, and A.K. Snover (eds.) Climate Change in the Northwest: Implications for Our Landscapes, Waters, and Communities, Washington D.C.: Island Press.